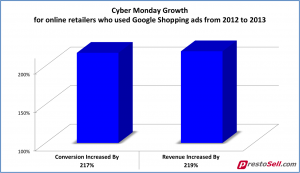 The holiday season is fast approaching, and online sellers know that Cyber Monday is the biggest day of the year. Online retailers who used Google Shopping ads over the past two years saw a 217% increase in conversions and a 219% increase in revenue between Cyber Monday 2012 and Cyber Monday 2013. You know that Google Shopping is the best place to promote your products. You’ve submitted your data feed, set up your ads, and you’re waiting for the sales. But have you considered how the time of the year, day of the week, or even hour of the day can affect shopping traffic and click conversion? You may even know that Mondays and Tuesdays in December tend to have the highest number of online transactions after Cyber Monday and Black Friday. Here’s something you may not know: there are days of the week and even times of the day that see significant increase in shopping traffic. So the question is – are you taking advantage of these trends in traffic? Does your advertising budget allow for a higher bid during busier times? Are you spending too much money on ads during off-peak shopping times? PrestoSell factors seasonality and holidays into our product ad optimization process. Ads are automatically “switched off” during off-peak hours when shopper views are not converting into sales, and then turned back “on” during higher traffic times. We even optimize your advertising costs to ensure your most profitable items receive the majority of your advertising budget. This drives higher-value clicks to your web store, and high-value clicks bring higher conversion rates. Which means better sales for you. Want to learn more? Find out how PrestoSell can help you SELL MORE and SPEND LESS.